A cholera patient receives treatment in Aden's Al-Sadaqah Hospital. (August 2018). Condemning the attack on Kitaf District in northern Sa’ada Governorate – and intensified fighting in Taizz city in the south-west of the country that shut another hospital at the weekend, Lise Grande, Humanitarian Coordinator for Yemen, said that it was “unconscionable” that facilities were being destroyed “just when people need them the most”. The Office of the High Commissioner for Human Rights (OHCHR), meanwhile, said on Wednesday that colleagues in Yemen were preparing to investigate the Sa’ada airstrike to verify the number of civilian casualties. According to the UN Office for the Coordination of Humanitarian Affairs (OCHA), at least two people were killed and five injured during clashes in Taizz’s Al Mudhaffer district. 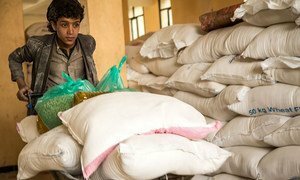 More than four years since fighting escalated in Yemen between supporters of Yemeni President Abd Rabbu Mansour Hadi and Houthi opposition groups, Yemen is the world’s worst humanitarian crisis, the UN says. In a recent appeal for help from international donors to save millions from starvation, UN Secretary-General António Guterres warned of an “overwhelming humanitarian calamity”.